Welcome back to my retrospective look at Sega. As we approach the end of the 90’s, Sega release their final gaming console. The Dreamcast was released in 1998 in Japan and came to America and Europe in 1999. This console was the first released in the 6th generation of gaming consoles, beating the PlayStation 2, Xbox and Gamecube for a release date. Despite this console being a fan favorite and despite the impressive opening sales and even some groundbreaking/impressive games like; Shenmue, Power Stone 2, Metropolis Street Racer, Rez and even some arcade perfect ports. Dreamcast sales just did not meet Sega’s expectations and continuing financial losses, The Dreamcast was discontinued in 2001, just 3 years after originally being launched. Even after the demise of the Dreamcast, it’s still considered an important machine as it was the first to include a built in modem for internet support and online play. In 2001 Sega of America officially announced they were becoming a third-party software publisher and would no longer produce hardware/gaming consoles. 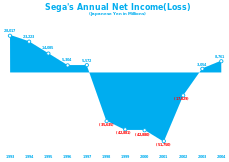 By 2002, Sega had five consecutive fiscal years of net losses and were in serious debt. Sega were in some serious financial trouble. CSK founder; Isao Okawa gave Sega a $692 million private donation and even talked to Microsoft in early 2000 about a possible sale of Sega or even a merger. But the talks failed and Isao Okawa passed away shortly after in 2001. In 2003, Sammy, one of Japan’s biggest pachinko and pachislot companies, bought 22% of the shares of Sega that CSK owned, and Sammy’s chairman; Hajime Satomi became CEO of Sega. Later in 2004, Sammy bought a controlling share the Sega Corporation at a cost of $1.1 billion, creating the new company; Sega Sammy Holdings, an entertainment conglomerate. From then on, Sega and Sammy became subsidiaries of the aforementioned holding company, with both companies operating independently. From 2003 onwards, Sega starting making a profit once again and even started to buy and form other companies/studios to join and help grow Sega worldwide once more. 2005 saw the forming of; Sega Racing Studio. In 2006, Sega Europe purchased Sports Interactive. While Sega of America purchased Secret Level in the same year and rebranded it to Sega Studio San Francisco. 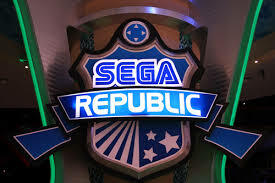 2013 saw Sega buy Relic Entertainment. From then on Sega have managed to maintain a good steady financial flow from it’s various studios as well as by developing and publishing games on various other machines…even allowing Sonic and Mario to team up in the Mario and Sonic at the Olympic Games series. 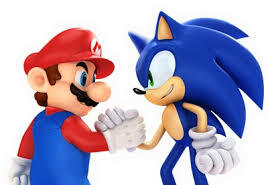 Sonic & Mario together in the same game was just not heard of in the 90’s. Sega even still continued to develop arcade games despite the arcade market being all but dead seeing as consoles had by this time become even more powerful than arcade machines. Sega Republic, an indoor theme park in Dubai opened in 2009. Where you can enjoy over 150 amusement games/rides/attractions based on Sega IPs. Then in 2013, in joint co-operation with BBC Earth, Sega opened the first interactive nature simulation museum in Orbi Yokohama, Japan. From 2012 – present, Sega have mainly been concentrating on the digital market. By bringing many classic Sega games as well as reboots and remakes to Xbox Live, PSN, Android and iOS. With games like After Burner Climax, OutRun 2, Crazy Taxi and many others…but still no Shenmue 1 or 2 remake or even Shenmue 3? Sega have certainly had a rollercoaster of a 75 years going from simple coin-operated machines, to help create and popularise arcades. To poor initial home market attempts to helping restore faith in the gaming industry after the 1983 game crash. Even shaping how we would game in the future with the Dreamcast. I don’t think there is much Sega has not done in the industry. 75 years of Sega. Love them or hate them, you can not deny they have been an important part of the gaming world. This entry was posted in LBoG: Retrospectives and tagged dreamcast, Game retrospectives, Isao Okawa, LBoG: Retrospectives, Little bits of gaming, retro gaming, Retro gaming blog, SEGA, Sega Corporation, Sega Europe, Sega of America, Sega Sammy Holdings on 04/06/2015 by Steve Perrin.